What is Open System Interconnection Model(OSI Model) and its 7 layers? OSI stands for Open System Interconnection as I mention in the title of the post.This model is develop by ISO company in 1978.This model allow communication between multiple networks.This model tells how data is travel from one node to another node in a network.This model represent different-2 layers/levels that tells how our data are transfer from one computer to another.This model overcomes all the limitations of TCP/IP model. TCP/IP contains only 4 layers i.e. 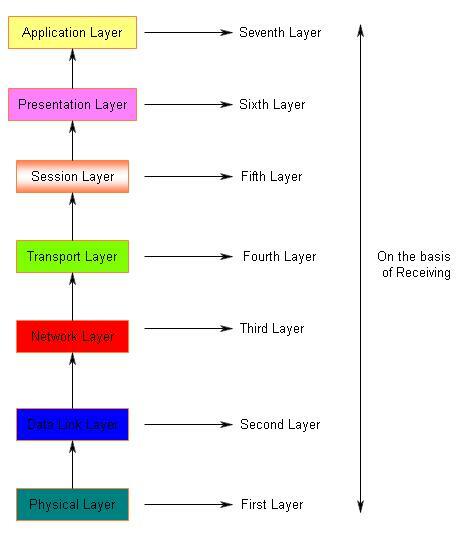 Application layer,transport layer,Internet layer and host to network layer but OSI model contains 7 layers i.e. application layer,presentation layer,session layer,transport layer,network layer,data link layer and physical layer. In OSI model transmission is done from application to physical layer and receiving is done from physical to application layer.Now I draw the diagram of OSI model that tells how data flow from one layer to other on the basis of transmission as well as receiving. 1)Application Layer:-Application layer is the seventh layer of OSI model.It contains applications,protocols etc.Applications like file transfer,email and protocols like FTP,HTTP etc.It is also called as data unit. 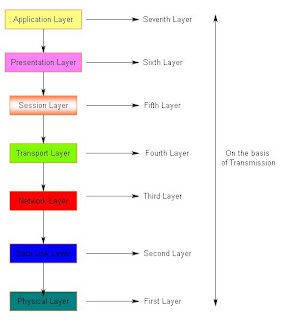 2)Presentation Layer:-Presentation layer is the sixth layer of OSI model.This layer is used for encryption of data and this layer is also used for compressing of data for fast transmission.It is also called as syntax layer. 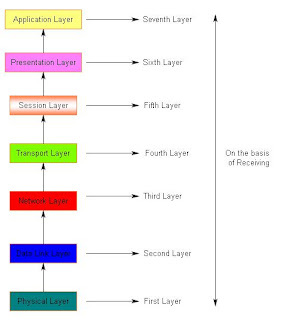 3)Session Layer:-Session layer is the fifth layer of OSI model.This layer is used to manage the dialogue session between the application of data.Session layer also uses different-2 duplex method like simple duplex,half duplex and full duplex. 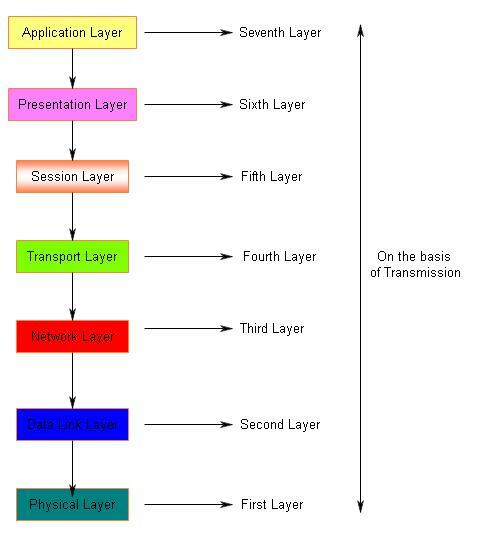 4)Transport Layer:-Transport layer is the fourth layer of OSI model.This layer is used for transfer data between network.This layer used two protocols namely TCP(Transmission Control Protocol) and UDP(User Data gram Protocol).TCP is the connection oriented protocol as well as it provide more reliable connection as compared to UDP.UDP is connection less protocol and it only receive or transmit data but not manage it as like TCP.It is also called as segment unit. 5)Network Layer:-Network layer is the third layer of OSI model.Network layer uses switches,routers.This layer is also called as packet unit.It represent how packets(group of data) are travels from one node to another. 6)Data Link Layer:-Data link layer is the second layer of OSI model.Those packets which are send from network layer are decode and encode in this layer.Data link layer is also called as frame unit.It has two sub layers i.e. MAC(Media Access Control) and LLC(Logic Link Control). 7)Physical Layer:-Physical layer is the first layer of OSI model.This layer receive data in the form of bit stream(0 or 1).It is also responsible for physical devices like Ethernet,cables,HUB etc.This layer is also called as bit unit.